Bud Light is presented as the beer for creative thinkers in “Drawing Board Skier”, a television commercial shown at the Super Bowl 2009. 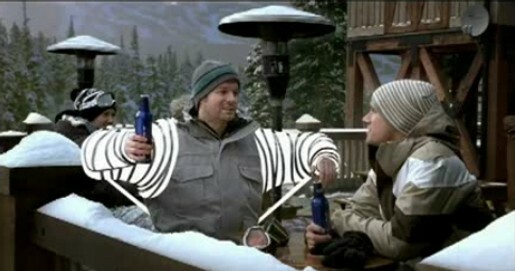 The ad, set as a conversation on drinkability, shows a Bud Light drinker using fellow skiers to explain the difference between Bud Light and other beers. The Drawing Board Skier concept was developed at DDB Chicago by group creative director Mark Gross, creative directors Chris Roe and Chuck Rachford, copywriter Jeb Quaid, art director Aaron Pendleton, executive producer Will St. Clair, producer Dan Bryant, associate producer Patty Phassos. Filming was shot by director Erich Joiner via Tool of North America with director of photography Mark Plummer, executive producers Jennifer Siegel and Brian Latt. Editor was Kevin Zimmerman at The Whitehouse Post. VFX ws done at d train and Filmworkers Club. Sound was recorded by Dave Gerbosi at Another Country.